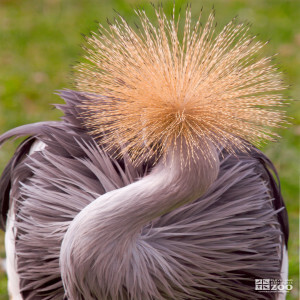 The range of the African Crowned Crane is central and southern Africa. The African Crowned Crane's habitat includes a mixture of wetlands and open grassland or savanna. African Crowned Cranes incubate their eggs from 28 to 31 days. Unique among cranes, the African crowned crane prefers to roost in elevated locations, especially in trees. They are quite social outside of the breeding season. They are usually seen in pairs or small family parties. Crowned cranes have a tendency to stamp their feet while walking through grassy vegetation, apparently to disturb and expose insects. These birds are also attracted to freshly plowed fields and tend to feed in short grass. They are sometimes attracted to rubbish dumps where insects are associated with waste food. Crowned cranes begin their dance differently than other cranes. Without moving their bodies, they bob their heads up and down 4-10 times. Then, spreading their wings, they jump 6-8 ft. into the air with their legs drooping motionless beneath them. Sometimes between hops they pick up objects from the ground and toss them into the air. Sometimes they call, sometimes they don't. The dancing crane often goes completely around his mate, and sometimes both dance. Both members of the pair help in building the nest. The female does most of the incubation, although the male takes over so she can forage for food. The male will stand guard about a mile away while the female is on the nest. Although the first and last eggs of a nest may be laid nearly a week apart, the entire clutch usually hatches within 24 hours. Once hatched, the chicks stay close to the nest for the first day, but by the second day they are off searching for food. The family will remain together for approximately 9 or 10 months.